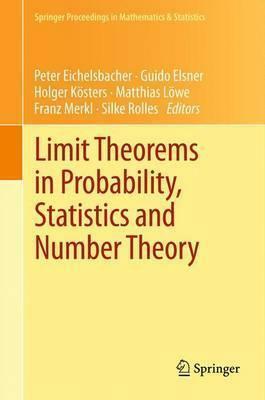 Limit theorems and asymptotic results form a central topic in probability theory and mathematical statistics. New and non-classical limit theorems have been discovered for processes in random environments, especially in connection with random matrix theory and free probability. These questions and the techniques for answering them combine asymptotic enumerative combinatorics, particle systems and approximation theory, and are important for new approaches in geometric and metric number theory as well. Thus, the contributions in this book include a wide range of applications with surprising connections ranging from longest common subsequences for words, permutation groups, random matrices and free probability to entropy problems and metric number theory. The book is the product of a conference that took place in August 2011 in Bielefeld, Germany to celebrate the 60th birthday of Friedrich Goetze, a noted expert in this field. Illustrations note VIII, 317 p.
The book is the product of a conference that took place in August 2011 in Bielefeld, Germany to celebrate the 60th birthday of Friedrich Götze, a noted expert in this field. W. van Zwet: A conversation with Friedrich Goetze.- V. Bernik, V. Beresnevich, F. Goetze, O. Kukso: Distribution of algebraic numbers and metric theory of Diophantine approximation.- J. Marklof: Fine-scale statistics for the multidimensional Farey sequence.- S. G. Bobkov, M. M. Madiman: On the problem of reversibility of the entropy power inequality.- G. P. Chistyakov: On probability measures with unbounded angular ratio.- M. Gordin: CLT for stationary normal Markov chains via generalized coboundaries.- T. Mai, R. Speicher: Operator-valued and multivariate free Berry-Esseen theorems.- T. Mai, R. Speicher: Operator-valued and multivariate free Berry-Esseen theorems.- R. Bhattacharya: A nonparametric theory of statistics on manifolds.- J. Lember, H. Matzinger, F. Torres: Proportion of gaps and uctuations of the optimal score in random sequence comparison.- Y. V. Prokhorov, V. V. Ulyanov: Some approximation problems in statistics and probability.- H. Doering, P. Eichelsbacher: Moderate deviations for the determinant of Wigner matrices.- O. Friesen, M. Loewe: The semicircle law for matrices with dependent entries.- A. Tikhomirov: Limit theorems for random matrices.